Offering you a complete choice of products which include domestic ro plant. 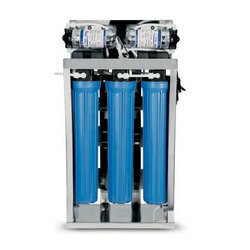 We offer compact Domestic RO Plant that is the best system for filtration and purification needs. Reverse osmosis plants are used to produce high-quality demineralized water, especially where the client looks to minimize the use of chemicals which are the regenerates associated with the more conventional demineralized ion exchange process. Looking for Domestic RO Plant ?